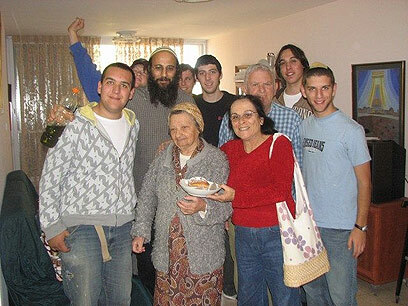 Every other week the boys studying at Mechinat Keshset Yehuda, a religious pre-military academy in the Golan Heights visit the homes of Holocaust survivors in the area and bring money, food, medicine and medical supplies. The boys also clean and fix up the survivors’ homes and, most importantly, help relieve the painful loneliness by sitting and listening to the survivor. Mechinat Keshet Yehuda has been working together with The L’Chaim Organization for the last four years in a special project that seeks out and helps Holocausts survivors that were simply forgotten about, who live in subhuman conditions and are, most of all, very lonely. The goal of this special program is to allow the survivors to live out the rest of their lives in dignity by adopting them. The L’Chaim Organization seeks out the survivors, raises the money and then organizes the care. “We found survivors living in conditions you wouldn’t believe; some sitting in their own urine and vomit. Their homes are barely livable. Even with all this, the most unbearable thing for the survivor is their loneliness…they have been forgotten, it’s a real shame to us all,” said L’Chaim’s Co-Founder and Organizer Daniel Braun. The impact this program has on the students is very powerful. “I believe that when we go to visit the survivors, we not only help the people there in need, we are helping ourselves as well. When we see people who suffered so much in their lifetime and still indeed have hope, it gives us hope and inspiration, too. "There are simply no words to describe the feeling of seeing the smile and joy that we bring these people. It shows us adolescents who are a year away from military service that there is something worth fighting for," remarked one of the students. Another student was affected so much that he decided to make aliyah to Israel. “The woman, who I go and visit, really changed my life. When I come to visit her, she constantly reminds me that Israel depends on us, the young people who are willing to make a difference, and she has really been one of the main reasons why I am doing aliyah," he said. Last week, some 50 survivors were brought to Mechinat Keshet Yehuda to enjoy a day in the beautiful and peaceful Golan Heights, courtesy of Mechinat Keshet Yehuda and The L’Chaim Organization. A few days before the survivors arrived, the kids of the local Kindergarten learned about holocaust survivors and prepared a show for them. The show was a huge success: smiles and laughter were on all faces young and old. See all talkbacks "Youth bring hope to Holocaust survivors "